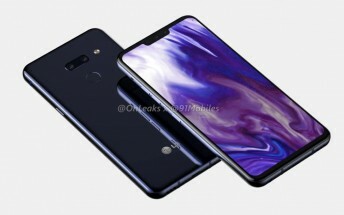 LG's G8 has finally received the leaked CAD-based renders treatment, ahead of its possible unveiling at MWC next month. There's also a video showcasing the renders, which you can find embedded if you scroll down a bit. This is definitely not a foldable smartphone, so if LG is in fact working on something like that, then it will get another name and might be part of a wholly new, more experimental series. 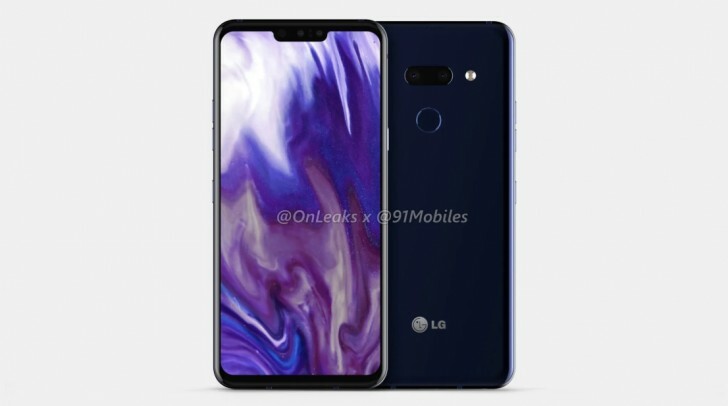 Other rumors have talked about an LG handset with an "attachable" second display, but we're not sure how that might work, especially on this phone that doesn't seem to have any special connectors for something like that. What the LG G8 does possess, however, is a run of the mill notch at the top of the screen - no hole punches here. It's also sporting a very discernible chin. The design is of the glass sandwich variety, and the handset is still rocking a 'normal' fingerprint scanner on its back, in a world that's filled more and more with under-display sensors. Oddly enough, it's only got a dual rear camera system, even though LG's V40 has gone up to three in that department. Perhaps the Korean company wants to keep some (needless) differentiation alive between its two flagship lines. The G8's dimensions are said to be 152 x 72 x 8.4 mm. Its 6.1-inch display will have a 19.5:9 aspect ratio. In the notch are dual selfie cameras, while a USB-C port is on the bottom alongside a speaker grille and a 3.5mm headphone jack. The right side houses the power button and SIM tray, while the volume buttons are on the left, with the Google Assistant key underneath them. Since 2019's top buzzword is 5G, there might be a version of the G8 with that. The device is expected to be powered by the Snapdragon 855 chipset, and it may have "sound on display" technology on board, that uses vibration and bone conduction. This is sort of confirmed by the fact that these images show no earpiece in the notch, but let's not jump to any conclusions just yet.